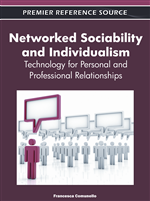 The aim of this chapter is to describe how the use of social media, especially the use of social network sites, is influencing public communication strategies and online users’ interactions. We conducted an exploratory analysis of the prevalent use of Facebook pages by Italian municipalities examining the characteristics of the online interactions emerging in the communication strategies of four Italian provincial capitals: Rimini, Reggio Emilia, Modena, and Venezia. We compared the four municipality pages on Facebook looking at the number of users, age composition, and gender. Then we carried out a content analysis to describe the prevalent kinds of posts published in the municipality Walls on Facebook. We concluded that Italian municipalities are now adopting different communication strategies on Facebook: each municipality proposes a particular content mix that creates a specific communication flow addressed toward citizens. Digital media and technologies are strongly modifying public administrations. Their impact is evident on administrative procedures, data management, functioning and delivering of public services and, moreover, on the communication between public organisations and citizens (Contini and Lanzara, 2009; Faccioli, 2000; Pieterson and Ebbers, 2008; West, 2005). The growth and development of Web 2.0 technologies (O’Reilly, 2005) has deeply changed the functioning and management of public administrations and government agencies. Above all there is a general request for a new phase of transparency, openness and participation (Sirianni, 2009; Noveck, 2009) where citizens can have an active role in stimulating innovative practices of communication and dialogue (van Dijck, 2009; Shirky, 2008; Tapscott, 2009). Moreover, using participatory and social media (Kaplan and Haelein, 2010; Rheingold, 2008; Shirky, 2008) citizens can contribute to creating new services or reshaping existing ones, remixing data and activities (Hilgers and Ihl, 2010), a typical process of our convergence culture (Jenkins, 2006). In this scenario social media, and in particular social network sites (boyd and Ellison, 2007), play an important role in re-defining relationships, power dynamics and communication strategies between institutions and citizens (Bennet, 2008; Castells, 2009; Dahlgren, 2009). Analysing best practices diffused worldwide it seems probable that nowadays social network sites, and Facebook in particular, could be strategic applications for enhancing transparency interaction between administrations and citizens. This is clearly evident in Italy where the great success and penetration of this platform is creating a lot of interest and expectations among users, public administrators and social media consultants. In Italy in January 2011 Facebook counts 18 million users, around 75% of Italian Internet users. Nevertheless in Europe and in Italy in particular there is a lack of in depth research analysing the real use of these online interactive spaces by public institutions and municipalities. The aim of this chapter is to provide an exploratory description of the prevalent uses of Facebook pages by Italian municipalities. Therefore we examined the characteristics of online interaction and communication strategies emerging in the Facebook Pages of four Italian capital cities of province: Rimini, Modena, Reggio Emilia and Venezia2. What are the contents generally published by municipalities in their institutional Facebook pages? What are the general traits of the users of a municipality Facebook Page? What are the prevalent kinds of questions, comments and proposals posted by users on the municipality Facebook Walls? What are the contents that better stimulate an high level of participation of users in terms of number of comments and appreciation (‘like’) of the messages?